Entering the door of newly decorated Aqua #2107, you are greeted with the beautiful deluxe open floor plan (one of the best 2 BR / 2BA floor plans in Panama City) with a kitchen featuring granite counter tops, flat top stove, full size side-by-side refrigerator, large breakfast bar and all the appliances, cookware, dishware and flatware you'll need for cooking, baking, or making that favorite drink to sip on the balcony! You'll also find a spacious living and dining area with sleeper sofa, plus a flat screen TV (with free cable and Wi-Fi) and DVD player. On your left, you will see a separate bunk area offering quiet and privacy with its own TV and DVD player. 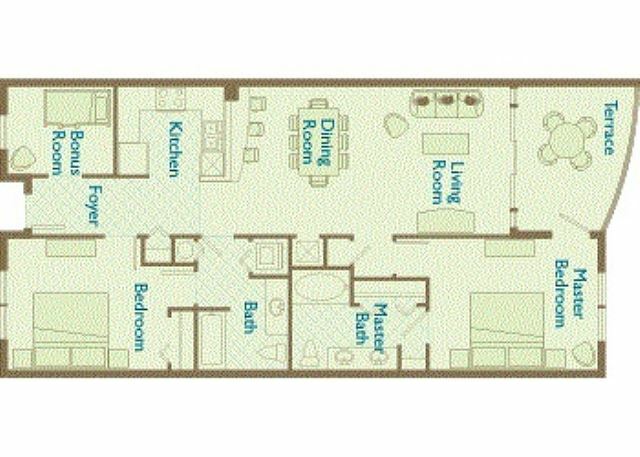 Across the hall is your second bedroom with attached full bath with tub/shower combo, as well as a stackable washer and dryer. Off of the spacious living room, you will find your large, Gulf-front master suite featuring king size bed (also equipped with new flat screen TV and DVD player) a tub/shower combo, double vanity and generous storage. Enjoy exquisite views of the Gulf of Mexico as both the living room and master suite have large glass walls with slider access to your extended, private balcony, equipped with lounge chairs and table. The 21st floor balcony is the perfect place to see for miles down the beach, or look far out onto the ocean to see dolphins, sea turtles, sting rays and other sea-life often seen from there. Sit, relax, and enjoy spectacular sunrises and sunsets as you listen to the waves crashing in and smell the salt air! And a great bonus is that this condo comes with free chairs at the beach! Aqua is one of the newer Luxury Condominiums, sitting right on the pristine white sand beach with amenities galore including: 2 outdoor lagoon pools, indoor heated pool and sauna, fully equipped Gulf front gym, and outdoor grill area. Aqua is just a short walk away from Pier Park, the entertainment capital of Panama City Beach, and just minutes away from multiple restaurants, Gulf World, Shipwreck Island, Camp Helen and St. Andrews State Parks and much, much more. Aqua #2107 – Your Home at the Beach! Free Beach Chair Service March to October! Second year in 2107, fourth overall at Aqua. The facility is fantastic. View from 21st is awesome. Owner made improvements, new flooring and kitcen counter facing which really helped. Aqua not only offers a great facility, the guests who come here are among the nicest people one could hope to meet. My family enjoyed the stay at Aqua this was our second visit here. The condo is very pretty and clean. The views are beautiful. Aqua is very close to pier park and all the shops the atmosphere is very fun. We would come back again. We love the Aqua stay there every year! It's nice ,clean and in a good location to everything I would recommend it to anyone!! We enjoyed staying in this spacious condo! It was perfect in every way and we would want to reserve 2107 every time! Very well laid out compared to others! We stayed 28 days in Aqua 2107 and had a wonderful time. The location is perfect - right on the water and within walking distance of Pier Park. The condo was clean except for the carpet which had quite a few stains. We liked the decor in the condo and there was lots of storage space. The girls in the office (Debbie and Heather) were very helpful and courteous. We will return to Aqua next winter!